This simple statement underscores the impact of Crossroads School on its students, families, and the professionals that deliver services at this special place. Kevin Hardy, Program Director, says this captures the character of the environment for our students who need a more supportive setting than traditional schools can provide. The cafeteria, the gym, and even the student lockers have been thoughtfully designed to encourage social interactions—a key element in the education of students with autism. Across the entire school, the common goal is to return the students back into the least restrictive setting possible, while enabling them to continue to learn and acquire new skills. The school environment is important for every student, but it plays a critical role for children with special needs. The student’s ability to make progress is greatly enhanced in the right environment with the appropriate teaching methods. The nuances are often small, but so very important. As the parent of a special needs child, I understand this all too well. Serving kids on the autism spectrum, The Crossroads School had previously been housed in a Natick office building with its lease coming to an end. DiMella Shaffer was approached by Albert Rex, a consultant of ours, to help Crossroads evaluate their options as they worked with Steve Prozinski and Hunneman to find a new, permanent home. Albert is on the Board of Trustees at Crossroads, Chairs the Development Committee, and has a son in the school. After a couple of test-fits in buildings along the I-495 corridor, a vacant 40,000 square foot office building was found in Marlborough that could accommodate the school. It was a perfect fit! I recently spent an afternoon at Crossroads, occupying their new building for just over a year, to check in and see what we could learn from the space we designed for them. We met in a discussion format with a group of senior leadership and faculty listed below. As moderator, I asked a series of questions to foster the discussion captured in the following exchange. I have taken the liberty to combine the responses from the group into a singular answer to each question, but I have occasionally attributed specific comments to an individual where I thought that it came particularly from their experience. Let’s start with “Every kid deserves a school.” How does the new building embody this statement? Kevin: It goes back to our first building in Sudbury. We made nice shifts in every move we have made, and this building continues that trend. It’s about romantically thinking back to what a school means. The Variety Show, Thanksgiving Feast, and other events; and spaces like the student lockers, cafeteria, and gym make a building a school. Historically, people with disabilities were not always treated appropriately. 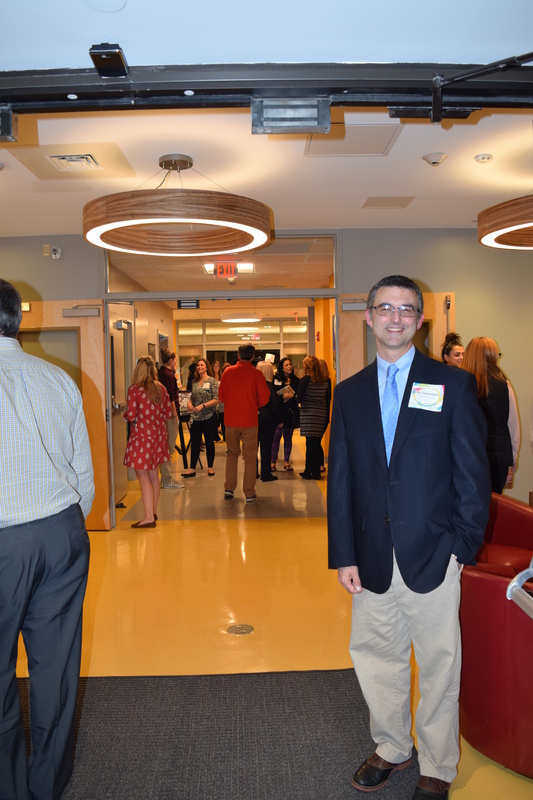 The new facility is a nod to providing our students with the environment they truly deserve—one that accentuates social opportunities in the classroom with the goal of preparing students to leave the clinical environment and return to a traditional classroom. Anthony: The staffing model is a 2 to 1 ratio, with 1 to 1 for the more severe challenges. These low ratios had allowed the classrooms to shrink to an 8-foot square room where each student had his own instructor in a controlled but very sterile environment. It lacked the social opportunities of a typical classroom. We have begun integrating them back into a larger classroom with a greater staffing ratio and we are starting with groups of 6 to 8 students. 2. How has the community been positively or negatively influenced by the new building and its move from Natick to Marlborough? The distance has not affected the community as much as we initially thought. We are receiving geographically different student referrals because of our proximity to new school districts. All our families made the student move to Marlborough. A few families were concerned about the increased travel time for their children; but saw this as a trade-off for improvements in the functionality of the building on a larger piece of land. Here is a picture of a morning meeting and what the students said about what they like about the new school. They said they like the gym, the trampoline in the cardio room, and the music room. Jack B. also mentioned the upcoming playground. 3. Which design attributes have made the most difference in your new space? Windows in the classrooms? Non fluorescent lighting? Better functional relationships? Windows in the classrooms have been awesome and definitely nicer. Having classrooms on two floors has helped. The noise level is better and it is calmer. We talk about having a pristine learning environment for students with noise sensitivity. They can better tolerate the current environment. Having the breakout rooms and timeout rooms close to the classrooms is great. We previously had to walk half the building so this reduces exposure to the attention getting behaviors and the time to act out. We are benefitting from the efficiency of having enough space. We spend less time on scheduling and accommodation and more on the mission. We had five conference rooms in the old space and now we have ten with a nice mix of small, medium, and large sizes. The 4-person rooms by the classrooms are well used and are very good for MCAS testing. Tony noted, “Jack is a prime example of how our lives are enriched in ways we did not anticipate. The ability to walk the building for exercise increases social opportunities for the students. Jack, our longest-enrolled student, walks the halls playing Christmas music and singing along at holiday time, enlivening the environment.” Tony often tags along with Jack to engage the students and staff. 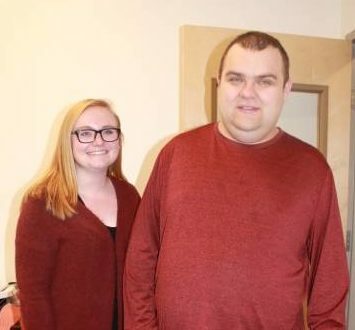 “He brightens my day when I see him.” This one example, and there are other students with similar stories, and is an important reminder to all the staff of how they contribute to the school’s mission. 4. Kevin anecdotally mentioned that the incidence of wall damage is way down? What do you attribute this to and are there other positive outcomes of the new space you could share with me? Purposeful ruggedness and durability were built in with the abuse-resistant drywall used throughout and with wider hallways. “How many wall kicks are we not hearing about because there is no damage?” The durability allows the teachers to not give attention to damaging behavior because the wall will not give way. The extra space, fewer students, and designation of one classroom corner as safe space give the clinicians more options to control behavior. The standardization of classroom size is a big help because it allows flexibility of the student population. This is a different approach from our previous facility where we varied the sizes based on the predicted age of the students, which was always in flux and resulted in some classrooms that were too small to accommodate older students. One of the less tangible outcomes is that we are able to redirect maintenance staff efforts to more productive tasks. 5. What things have you found that were missing from the new building either in program or design features? You initially developed a very thorough program; has functioning in the new space pointed out needs you did not anticipate? It should be said that there were many ideas beyond what is currently in the building, but we had to reconcile our wish list with what we could afford and accomplish in the schedule. “Value engineering became a term that I was intimately familiar with, which I had not heard of before.” Generally it came out well, the kids seem happy and everything works. We could have used more sound attenuation in the hallways and classrooms. A lot of the time we don’t use the lights since the windows give good natural light. The electrical operating costs were underestimated because we retained the old HVAC equipment to save money on the build out. A gym/playground is the main thing that we are missing and we are still working on it. We hope to install a playground in the near future. Chair rails would have been nice because they make use of the perimeter in the classrooms or higher quality paint that could be better cleaned. The arrival and drop-off process is still a site logistics challenge. The music room should have had more soundproofing put in the walls and shouldn’t have been located next to a heavily used meeting room. It would be useful also to recognize that women primarily staff schools for autism. The ratio is approximately 75% female and 25% male. Many of these women are in their child-bearing years. We should have built a private room for nursing, which we have since added, due to a significant number of births among the staff. 6. Can you name some favorite features of the new space? The restrictions of the space are reduced and it allows a better delivery of services. For example, we don’t need to plan for timeouts. If a room is already occupied, there is another one and it makes it more effective for both students. The new space eliminates the upstairs/downstairs functional separation of administration and classrooms that we had in the previous building. 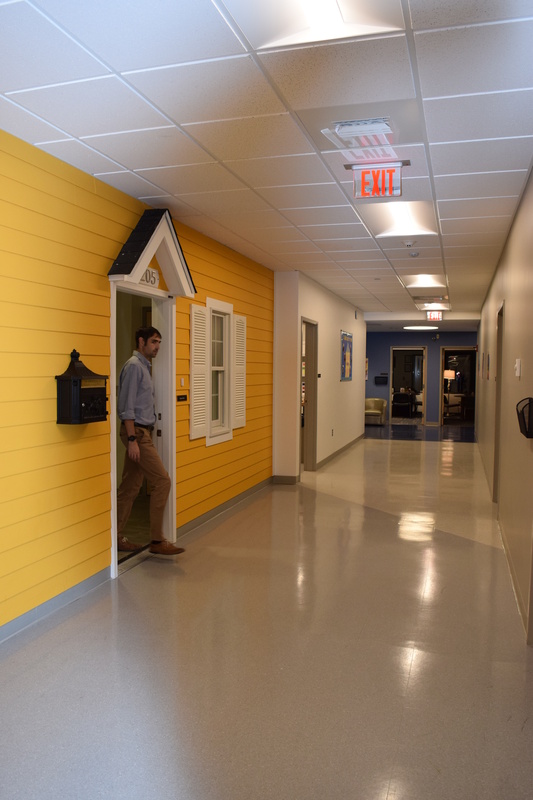 Having the nurse close to the front door and the various features like the school store, music room, temporary gym, and art room that bring people to different parts of the building increase the opportunities for socialization. The Sunshine Committee was created to get the staff together and put more effort into getting to know each other, thus increasing teamwork. We went from 6 bathrooms in the old space to 13; they are also more strategically located so we don’t have to hold it as long, eliminating the joke about teachers needing an “iron bladder.” We love the space for the elbowroom, but people are more far flung and classroom teachers should not to be cutoff from communication for safety reasons. We have invested more in technology by getting walky-talkies for enhanced in building communication. 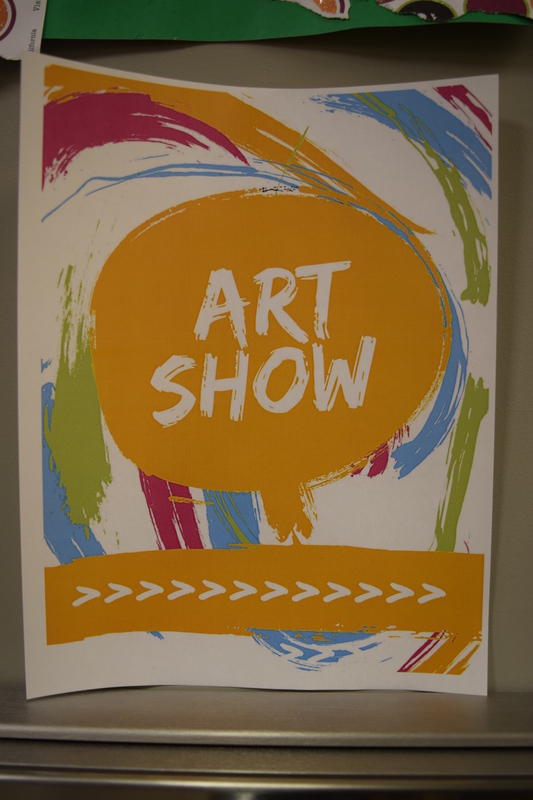 The Art Show is one of the annual events that fosters the community at the school. 7. 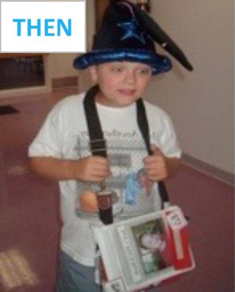 If we were planning a new school for autism, what advice would you give us? “Make it like this one.” Involve everyone, especially the clinicians and the school community. “We got a lot of that right here.” But also recognize that some people in administration don’t have clinical experience. They liked the design charrette for getting people invested, including the parents. The four-hour conversation about the bathrooms was a situation where our needs were not initially understood, but it opened up a good conversation that led to a successful result. After the inclusive programming process, people were so invested that parents and staff helped us move in and even assemble furniture. 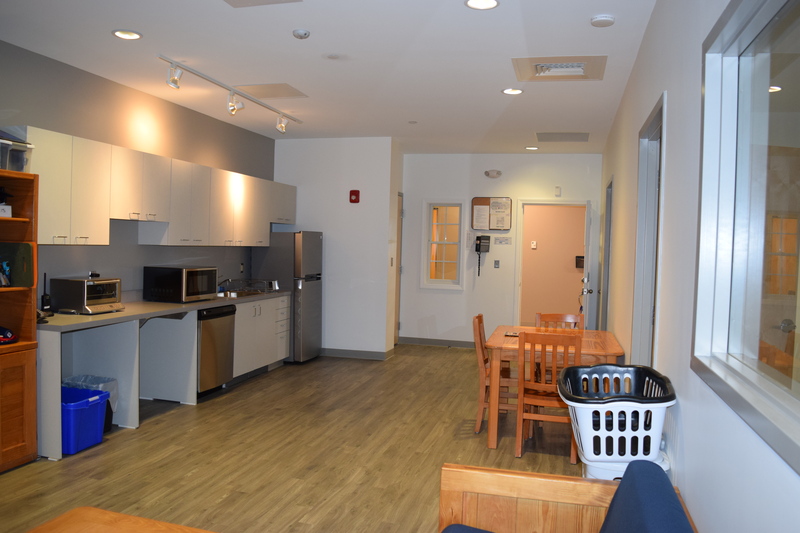 The apartment entry is from the corridor, and inside the students practice their ADL’s in the living/dining/kitchen area. The bedroom/bath is to the right in the picture. 8. How have the apartment and simulated medical, dental, and salon spaces helped in working with the students? Do you have one success story? At least one student in every class needs help with services. We can work on doorbell safety, the fire alarm, and brushing teeth all at the same time. For example, one student is now able to do his morning routine with 100% independence and is now working on his night-time routine. 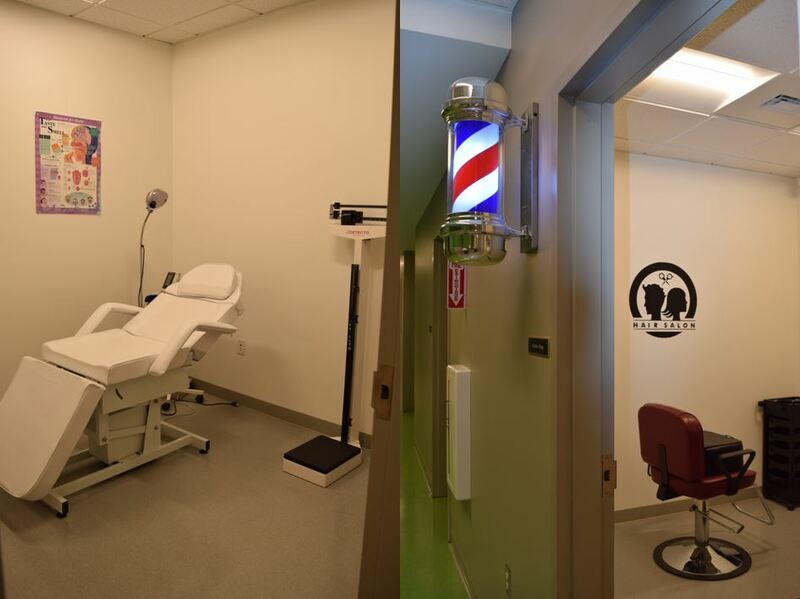 The simulated dental, medical, and salon rooms approximate the experience of visiting the dentist/doctor and hair salon, allowing students to practice related activities and prepare for a visit to the real thing with their families. Jack has been a student at Crossroads School for 15 years. 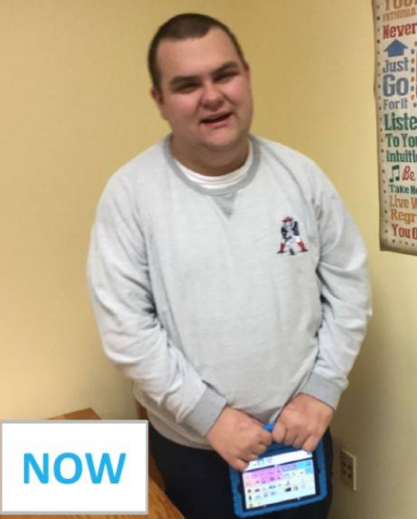 From Sudbury, to Natick, to Marlborough, Jack has grown with the school. While Jack has reached many milestones during his time at Crossroads, just last week, Jack achieved, what I would describe as one of his biggest accomplishments. On Tuesday, Jack went to the dentist. Historically, dentist appointments have been challenging for Jack. Prior to this dentist visit, Jack has been visiting the Crossroads’ Dentist Office. This de-sensitization program allowed Jack to practice going to the dentist in a controlled environment. At Jack’s dentist appointment, I had to fight back tears for all the right reasons. I could not believe what I was seeing – at 20 years old, Jack had his first successful dentist visit! The hygienist and the dentist at Silbia’s Dentist Office were incredible and patient, but Jack’s successful appointment would not have been possible without all the work that Crossroads has done. On Sunday, May 6th, Crossroads is hosting their annual 5K and Family Fun Day, an event that Jack, my daughters, my husband, and I have enjoyed for many years. 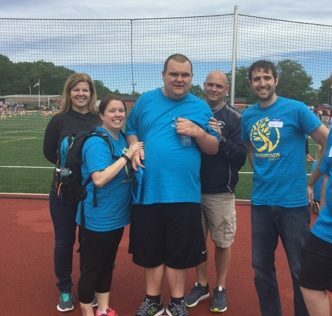 Whether running the race or volunteering at the event, we are there to support Crossroads School, the incredible staff, and all the progress that is being made by students every day. We hope you will join us. 9. The purpose of our firm is to help our clients make the world more beautiful, functional, and sustainable. 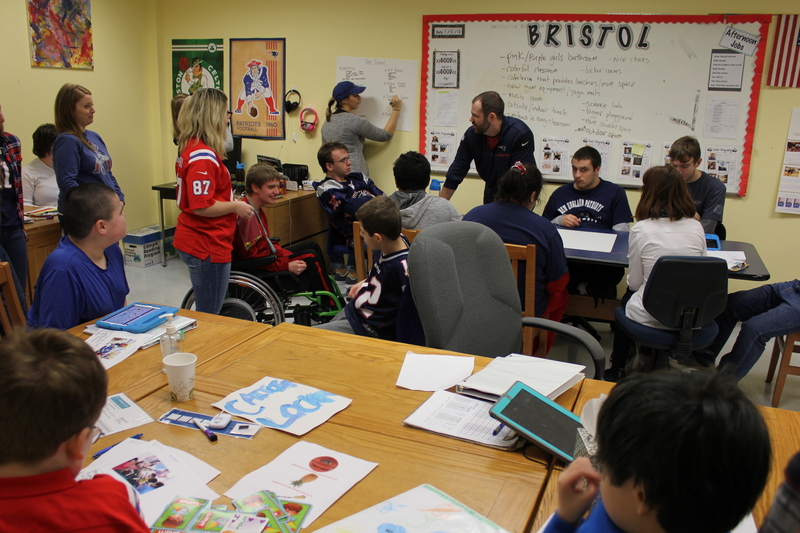 From your perspective, how does the Crossroads School project embody that purpose? The apartment is one element that contributes to our goal of creating functioning members of society. It allows us to help our students succeed at their activities of daily living so they will not be dependent upon others their whole life. The new building allows for greater success towards that goal. The designers from DiMella Shaffer helped us plan for functionality, and also delivered on beauty. The design team helped us incorporate our branding colors throughout the building, leading to vibrant spaces for learning. The use of these colors was also functional, helping to differentiate different spaces within the building. 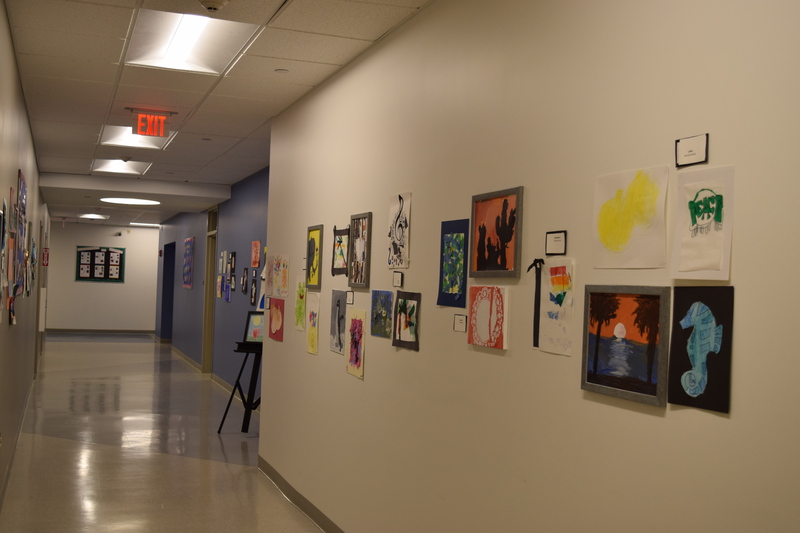 There is also something beautiful about a special education school that captures the vibrance and creativity of our students and staff; while our work is clinically important, the spaces do not feel clinical or sterile, as some programs do. The thoughtful approach to starting to plan the building with a community charette ensured that all the new learning spaces are functional and sustainable – meeting the needs of both current and future students. As our latest foray into a new project type, The Crossroads School followed the model of a specialty project like the Franklin Park Zoo, where an expert owner team was able to provide us with great programming information to effectively plan the new building. It quickly allowed us to get a wealth of information on the program and perception of the community about the school. It helped to set expectations about what could be accomplished in the tight budget and an even tighter schedule. It gave a chance for everyone to speak and to be heard, thus reinforcing the project support from all stakeholder groups. Not every project we work on has the capability to make such a profound difference in peoples’ lives, but the commission for The Crossroads School was one of those truly memorable and continually rewarding experiences that makes the world more beautiful, functional, and sustainable in ways beyond architecture. We are grateful to have been a part of giving Crossroads a new home.